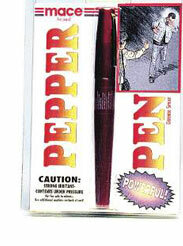 Designed to repel attackers, this powerful pepper formula is contained inside a handy pen-like unit. The Pepper Pen is a convenient and subtle way to carry the protection you need into any environment. This low key package houses a powerful self protection pepper delivery system. The pen clip easily attachés to a pocket. It contains 5 one second bursts. The 10 gram stream sprays up to 10 feet. Pepper Shot is a 10% pepper spray rated at 2 million scoville heat units and made with a very fine grain that is more effective than the coarser grains of most other pepper sprays. In addition to causing an attacker pain, Pepper Shot swells the mucous membranes, which makes breathing difficult, and swells the veins in the eyes, causing the eyes to close. These effects last 20-30 minutes and cause no permanent damage. Purchase yours today and feel safe! This Pepper Spray Pen can be delivered in 3 to 5 business days. If you would like to receive your order sooner, guaranteed 3 day, 2 day and next day delivery options are available upon checkout. Orders placed by 2:00 PM central time ship the day they are placed. If you have any questions or concerns call our customer support staff at 800.960.2015 or click the live chat button at the bottom of this page. Our courteous and professional customer support team is always glad to help!